One of the features that has become common in smartphones these days is the support for fast charging technology. However, smartphone manufacturers are looking to develop solutions that can make it faster. Currently, Oppo’s SuperVOOC is the fastest charging technology available in the market for smartphones, which charges the device at 50W. Now, China-based smartphone maker Xiaomi has introduced even faster technology. Lin Bin, President and co-founder of Xiaomi, has shared a video of its latest fast charging technology which can charge the smartphone at 100W — twice as fast as the Oppo SuperVOOC. He revealed in the post that the company’s engineers have successfully tested this technology. It can charge a 4000 mAh battery in just 17 minutes! 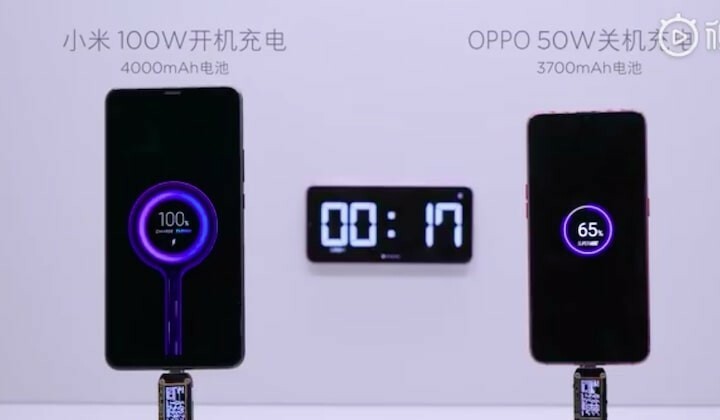 In the video, it has been showcased that the smartphone with Oppo’s SuperVOOC could only charge up to 65 percent by the time the Xiaomi’s device with 100W fast charging was completely charged. The video hints that the technology is named Super Charge Turbo. As of now, there’s not much information available related to this technology apart from the demo video shared by the Xiaomi’s president Lin Bin. However, Lu Weibing, head of Redmi products, has confirmed that Redmi will be the first to mass produce this Super Charge Turbo technology, but he has not provided any timeline.